It’s every parent’s worst nightmare. You wave goodbye to your teenage daughter as she heads, carelessly off to an evening out with friends, never to return. 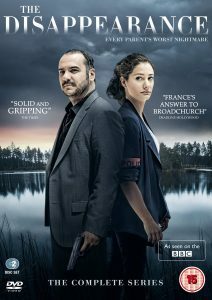 The Disappearance is an astonishing piece of film-making, managing, over eight utterly compelling episodes, not only to craft the tense and gripping mystery you’d expect, but also to capture the heart-breaking human catastrophe at the heart of the story. Personally, I wouldn’t class this multi-award winning French drama as Nordic Noir. For me it’s not only pacier and more densely plotted than your average Nordic tale, its cast of characters and situations are as fleshed out and three dimensional as any Agatha Christie classic you’d care to mention; whilst the performances are heart-stopping across the board. Okay, so I guessed the real killer (and the twist) well before the third episode completed, but this hunch diminished neither the tension built throughout the eight episodes, nor the need to find out what happens next at every turn.